A minimum of 2 adult passengers is required for the tour to run. If the minimum size is not reached, the tour is subject to cancellation and all tickets will be refunded or rescheduled. Please bring hat, sungasses, sunblock, camera, bug repellent, thin pants, rain gear, long sleeve t-shirts. personal medication, & passport (passport is required). This morning will take a scenic boat ride across Lake Atitlan to the village of Santiago Lake Atitlan is renowned as one of the most beautiful lakes in the world; German explorer Alexander von Humboldt is the earliest prominent foreigner to be quoted as calling it "the most beautiful lake in the world" and Aldous Huxley famously wrote of it: "Lake Como, it seems to me, touches on the limit of permissibly picturesque, but Atitlán is Como with additional embellishments of several immense volcanoes. It really is too much of a good thing." Arrive to the village of Santiago Atitlan the town sits on a bay of Lago Atitlan between two volcanos. Volcan San Pedro rises to 2,846 metres (9,337 ft) west of town; Volcan Toliman rises to 3,144 metres (10,315 ft) southeast of town. Volcan Atitlan, with a summit of 3,516 metres (11,535 ft), is south-southeast of town. Santiago Atitlan is southwest of Panajachel across the lake. to visit the Mayan God Maximon and learn about the spiritualism and beliefs of the T’zutujil Maya. We learn about the textils, a woman will wrap her head with the long headribbon or cinta that resembles a halo when in place, women backstrap-loom and embroider their lovely huipiles, as well as the pants worn by men. 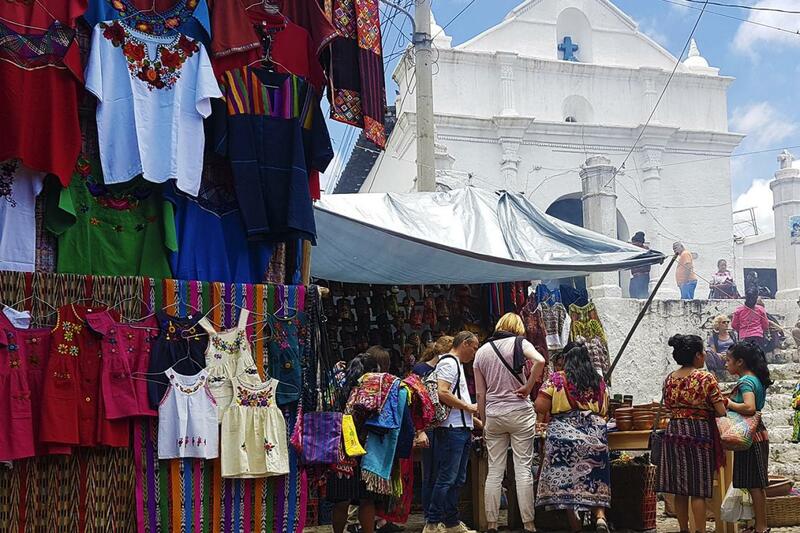 We will visit the Santiago Apostol Church, was built between 1572 and 1581, and has been restored and reconstructed several times after significant earthquake damage. It has three altarpieces representing the three volcanoes that tower over the village. We return to Panajachel to take a walk in the Santander Street, Time to Lunch (not Included). At the end transfer to Guatemala City.